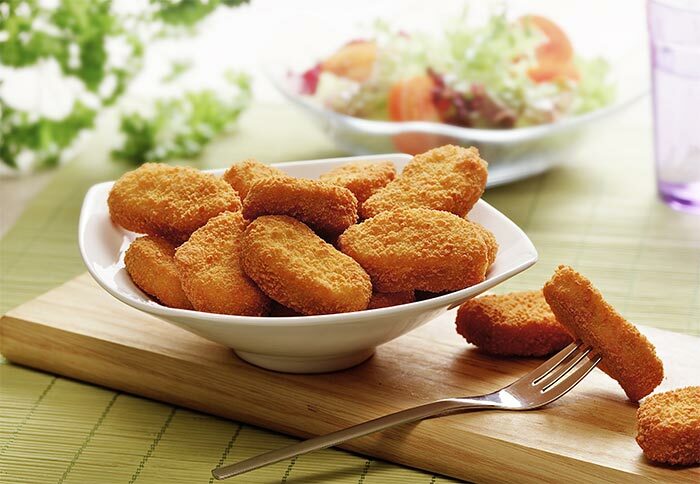 Chicken nuggets are delicious and loved by both kids and adults. But they are a little on the unhealthy side if you buy the frozen and processed ones from the store. 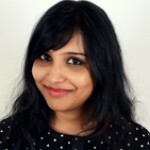 And of course, you must watch what your kids eat and take care of what you consume too because the preservatives can have a bad effect on your health in the long run. 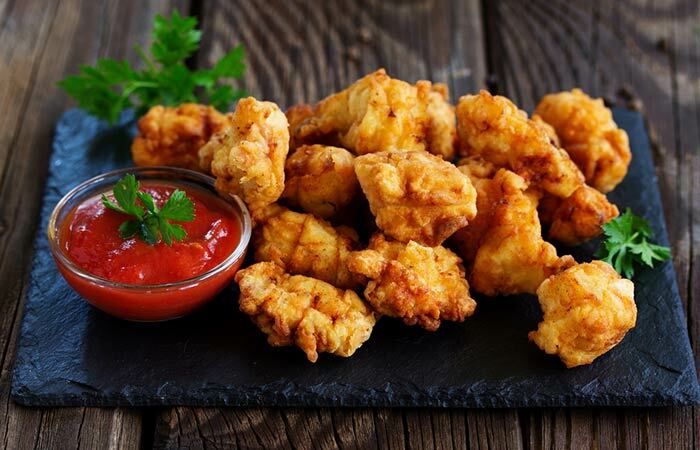 So, here are top 20 homemade chicken nuggets recipes that are healthy, tasty, and safe. 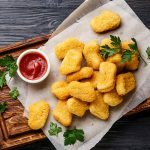 Scroll down to find out how you can make the best chicken nuggets you or your loved ones have ever had! Mix the garlic powder, salt, ¼ teaspoon pepper, and all-purpose flour in a plastic bag. Throw in the chicken cubes and shake it well to coat the chicken pieces with the flour. Now, transfer the breadcrumbs to a plate and add a little salt. Mix well, and keep them aside. Whisk the egg with a tablespoon of water. Now, dip the chicken pieces first into the egg and then the breadcrumbs and coat on all sides. Refrigerate the chicken pieces for 20 minutes. 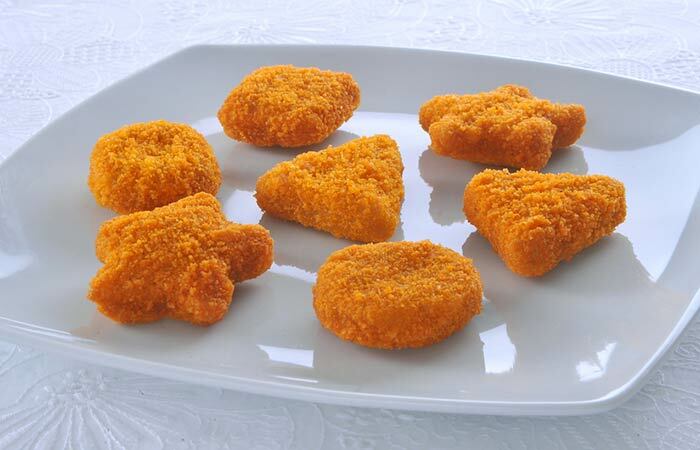 Heat olive oil in a pan and fry the chicken nuggets until golden brown. Transfer the buttermilk into a large bowl. Add the chicken pieces to it and cover with a cling film and refrigerate for an hour. 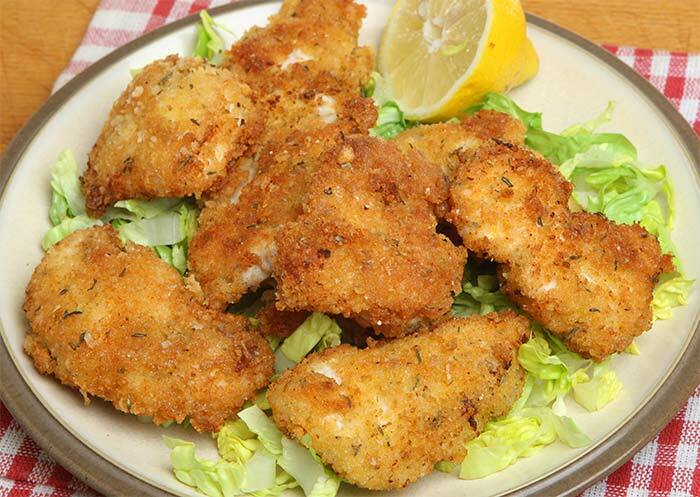 After an hour, discard the buttermilk and toss the chicken pieces into a blender. Add lemon juice, garlic powder, low-sodium soy sauce, chopped parsley, chopped chives, grated cheddar cheese, hot sauce, and salt. Blitz it until you get a smooth texture. Take out the paste and make 1 inch by 2 inch nuggets. Transfer the flour to a plate and mix it with a little salt and black pepper. Transfer the breadcrumbs to another plate. 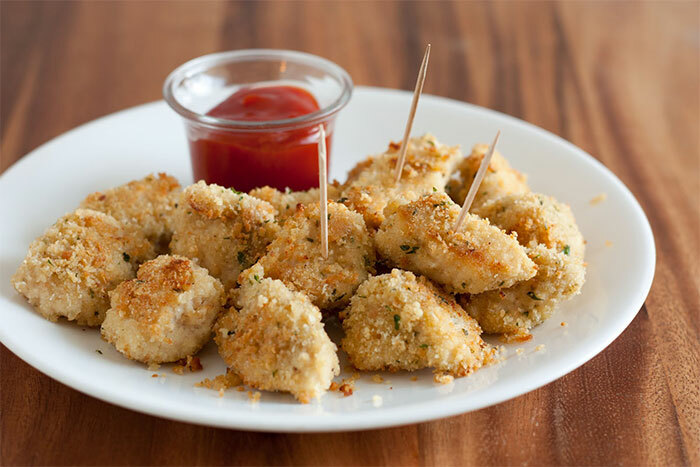 Now, first coat the chicken nuggets with the flour, then dip them into the egg, and finally coat them with breadcrumbs. 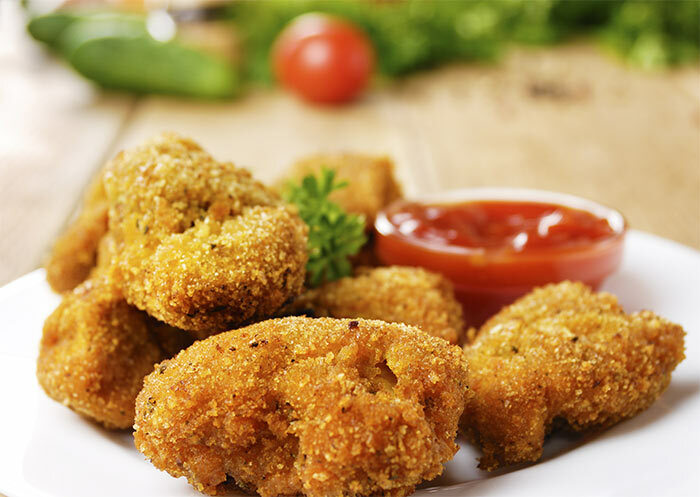 Heat olive oil in a pan and fry the nuggets until they are golden brown. Serve hot with mayonnaise or ketchup. Boil the chicken cubes for 20 minutes. Blitz the boiled chicken, salt, lime juice, honey, mustard, egg, black pepper, and salt. Make small balls out of the blended chicken and pack them into a cookie cutter and give them different shapes. Transfer them into a baking tray. Drizzle butter on top to make them crispy. Bake at 200°C for 10-15 minutes. You can turn them over to make them crispy on both sides. Marinate the chicken cubes with lime juice, a little salt, and pepper for 10 minutes. Meanwhile, combine the almond flour with salt, smoked paprika, onion powder, and garlic powder. Now, take the chicken pieces and first dip it into the egg and then the flour mixture. 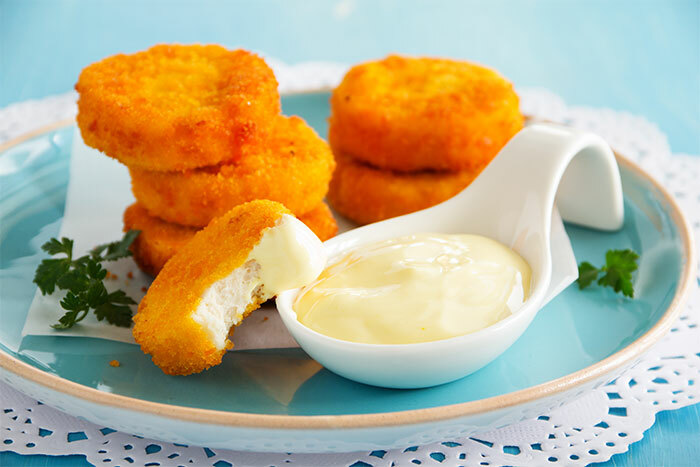 Heat the ghee in a pan and fry the chicken nuggets until golden brown. 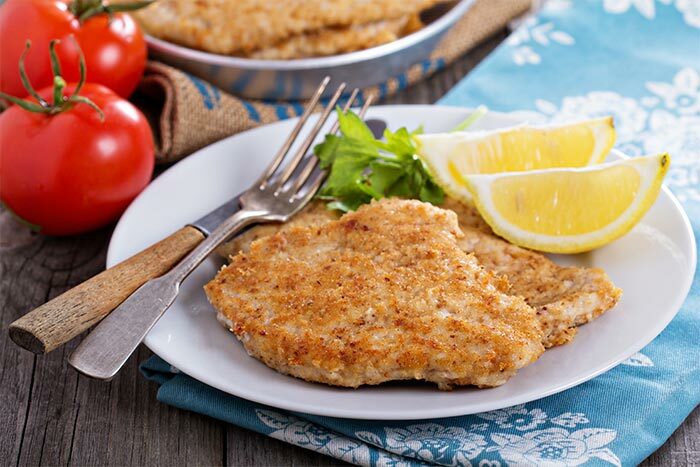 Combine onion powder, garlic powder, paprika, parmesan cheese, whole wheat breadcrumbs, and flaxseed meal in a bowl. 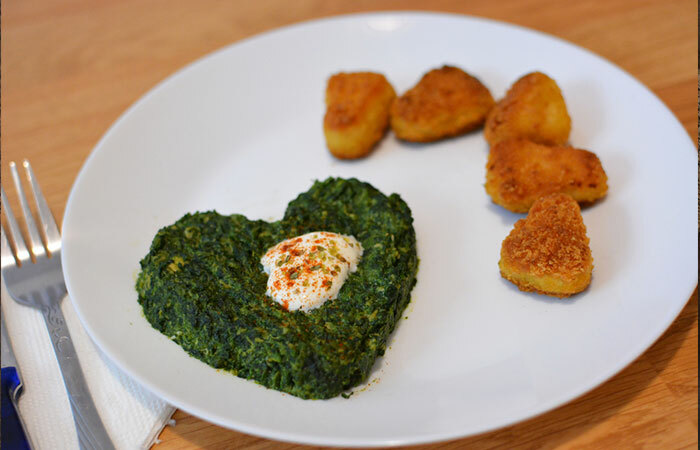 Mix the spinach puree, egg, and a little salt in a shallow bowl and keep it next to the bowl containing the flour mixture. Garnish the chicken cubes with salt. Now, dip the chicken pieces into the egg and spinach mixture. Then coat with pieces with the breadcrumb mixture. Refrigerate the chicken nuggets for 20 minutes. 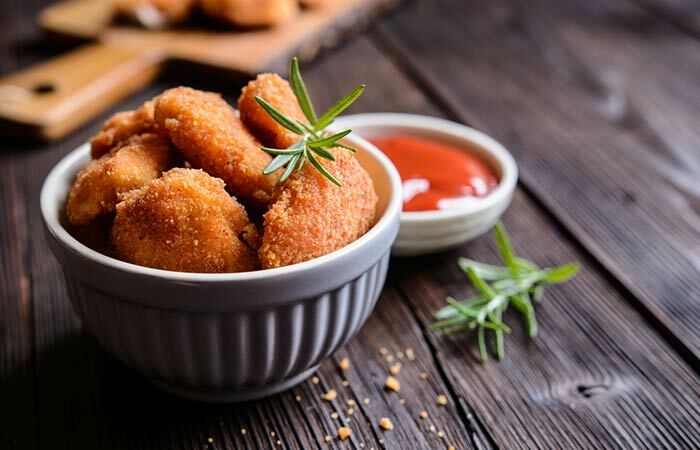 Heat olive oil in a pan and fry the nuggets until golden brown. Mix the chicken cubes with honey, lime, paprika, thyme, and mozzarella cheese in a bowl. Whisk the egg in another bowl. Mix the all-purpose flour with salt and pepper on a plate. Mix the cheddar cheese with 5 tablespoons breadcrumbs. 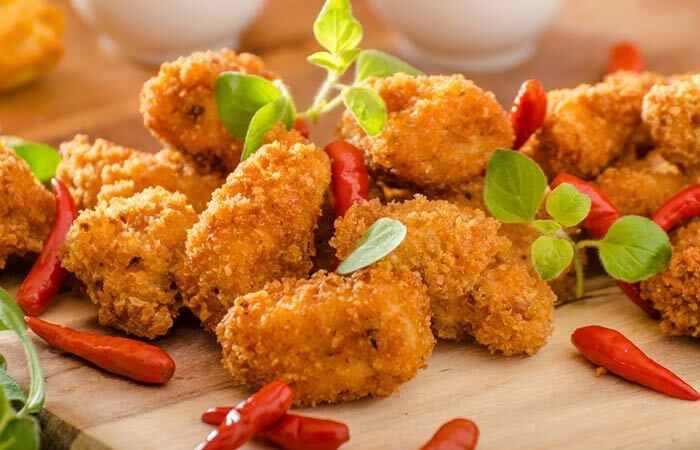 Now, take the marinated chicken cubes and coat them with flour, then the egg, and then the breadcrumbs and cheese mixture. 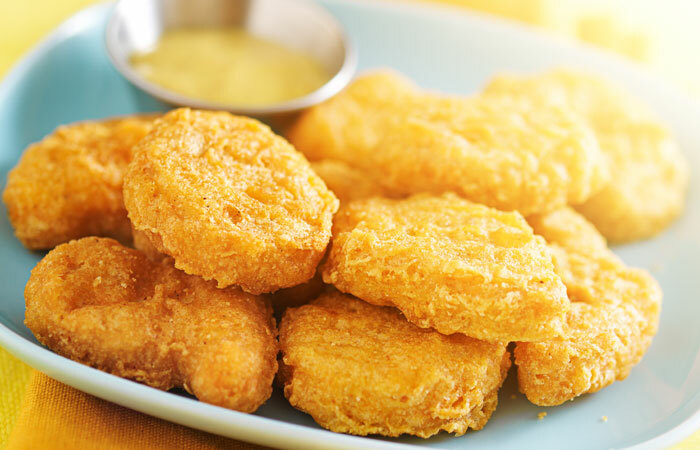 Heat the oil in a pan and fry the chicken nuggets until they are golden brown. In a bowl, whisk the buffalo hot sauce and butter. In another bowl, mix the breadcrumbs, salt, Italian seasoning, pepper, and parmesan cheese. Dip the chicken in the hot sauce mixture and then coat with the breadcrumb mixture. Lightly grease your baking tray and place the chicken nuggets. Bake for 20 -25 minutes until they turn golden brown. Combine the chicken cubes, milk, lime juice, thyme, garlic, black pepper, and salt in a bowl. Cover with a cling film and keep it in the fridge for 20 minutes. Blitz the rice Krispies to form a fine powder. Add all-purpose flour, salt, and pepper to the rice Krispie powder, mix well, and transfer to a plate. Whisk the egg with 1 tablespoon water in a bowl. Take the chicken cubes from the fridge and roll them in the flour, then dip in the egg, and then coat with the rice Krispie powder. 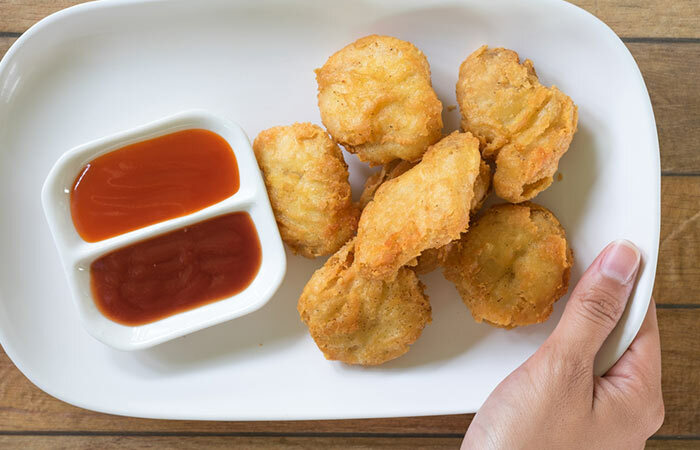 Heat the oil in a pan and fry the chicken nuggets until golden brown. Serve with hot sauce mixed with ketchup. 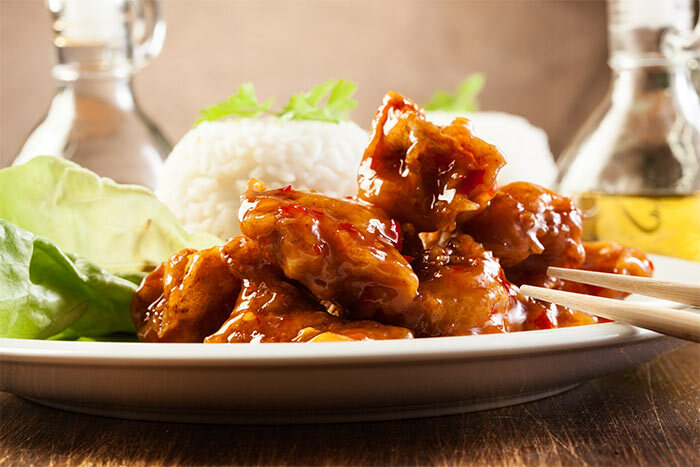 Mix the chicken cubes with salt, ½ teaspoon pepper, barbecue sauce, and lime juice. Keep it aside for 10 minutes. Combine the garlic powder, all-purpose flour, salt, and ½ teaspoon black pepper in another bowl. Transfer the cooked quinoa to a shallow plate. Coat the chicken pieces with the flour first, then dip them into the whisked eggs, and finally coat with the cooked quinoa. 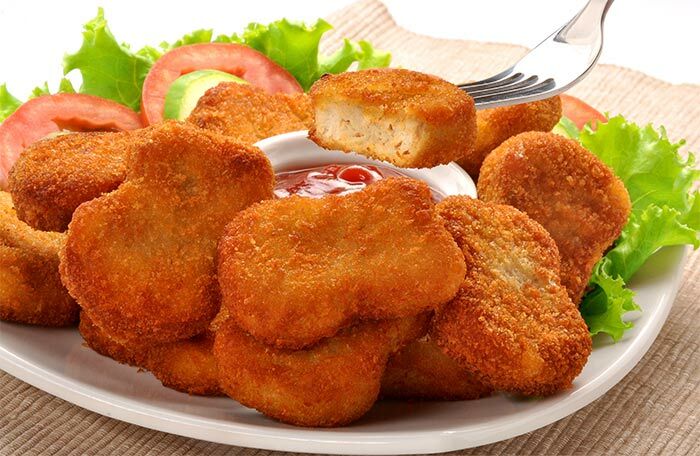 Spray the chicken nuggets with non-stick cooking spray and bake until they become golden brown on the outside. 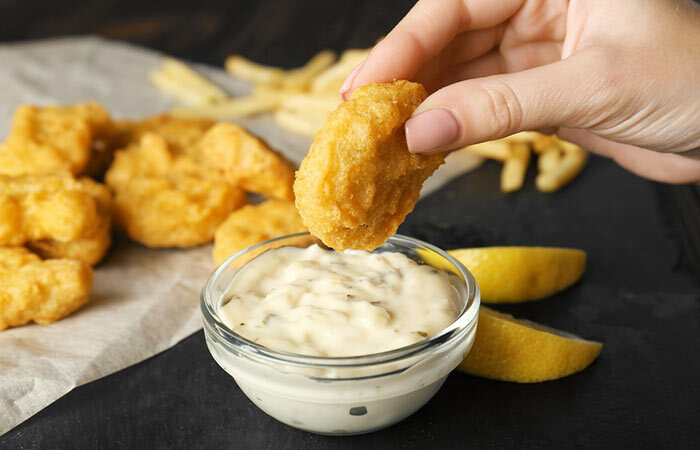 Serve with honey mustard dip. Use a grinder to make a fine powder of the almonds. Combine the ground almonds with salt, paprika, garlic powder, and ½ teaspoon pepper powder. Whisk the egg and milk in another bowl. Transfer the all-purpose flour onto a shallow plate. 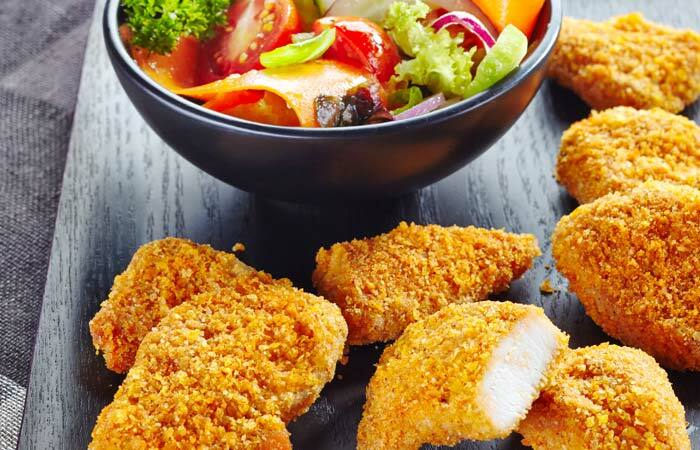 Take the chicken pieces and roll them in the all-purpose flour, then dip them into the egg mixture, then coat them with the almond mixture. 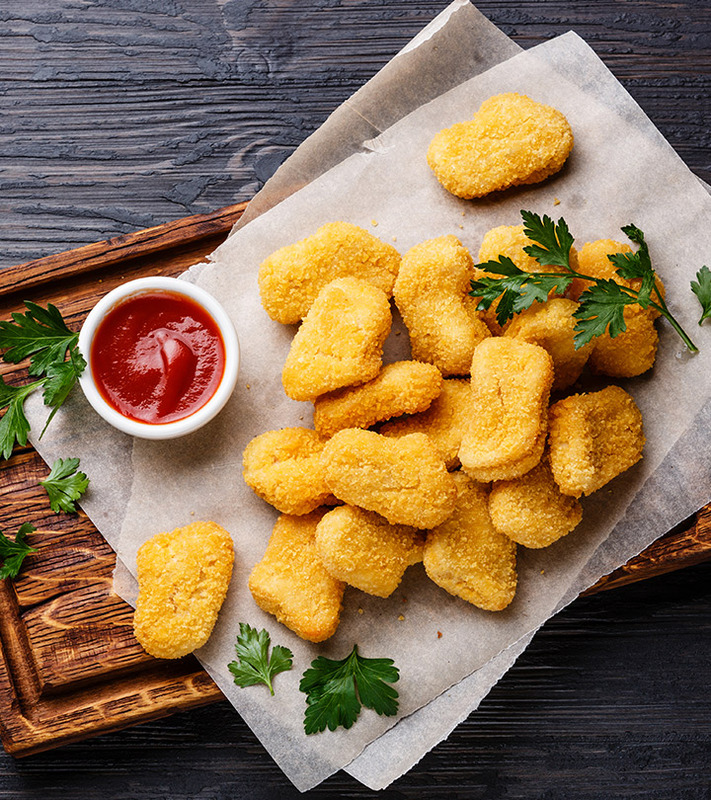 Spray the chicken nuggets with cooking spray. Bake for 10-15 minutes until they turn golden brown on the outside. Then, cut the chicken breasts into small cubes. In a bowl, blend bread crumbs, basil, thyme, salt, and cheese. Now, dip chicken pieces in the butter and coat with the mixture. Put coated chicken pieces on a greased cookie sheet. Putthe chicken pieces in a bowl. Pour the eggs and buttermilk into it, cover and then refrigerate for 20 minutes. Mix all the spices andcoat the chicken pieces in the mixture. 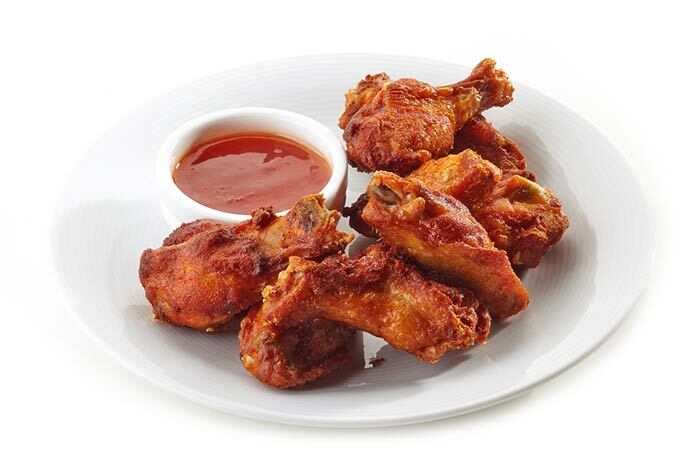 Deep fry each chicken piece in oil. Sauté the onion and pepper till they become soft. Boil broth, vinegar, soy sauce, and syrup together. Blend cornstarch and the juice of pineapple. Add this to the broth. Finally, add the chicken nuggets. Cook for some time. Pour in sautéed vegetables and serve hot. Cut the chicken into cube-shaped pieces. Heat olive oil in a big pan. Cover the chicken pieces with cornstarch. Cook the pieces in heated oil until they are brown on all sides. Pour in a small amount of the soy sauce. Pour some honey over the chicken pieces and keep them in the refrigerator for 15 minutes. Now,transfer the beaten egg into a shallow bowl. Blend salt, bread crumbs, and flour. Dip chicken pieces in egg and then roll them in the flour mixture. Heat oil in a big pan. 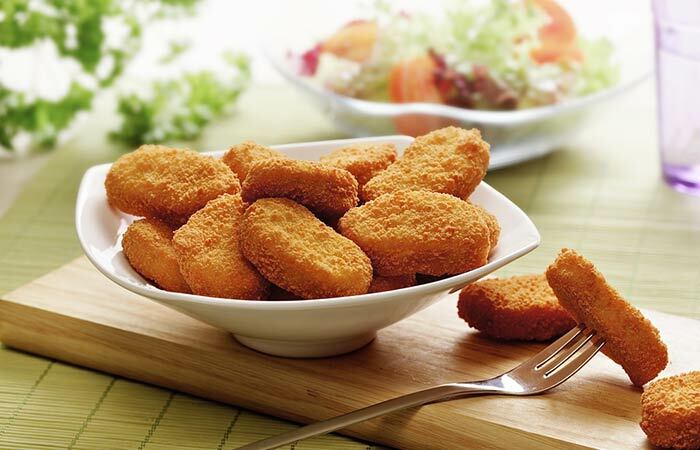 Cook the nuggets till they become golden brown. Season chicken pieces with salt, green chili paste, and spices. Then, cover the chicken nuggets with the cheese. Whisk eggs and vinegar in a bowl. Then, dip chicken pieces in the egg and cover with the crumb mixture. Drizzle melted butter on the pieces and put on a greased baking sheet. Bake the pieces for 10 minutes, and then flip. Cook until the pieces turn brown on all the sides. At first, preheat oven to 400°F. Mix the soup mixture with black pepper, salt, and bread crumbs. Now, beat the egg with a whisker separately. Dip the chicken pieces in the egg mixture and cover with the crumb mixture. Put chicken pieces on a baking sheet. Bake for 20 minutes or so. The pieces will turn golden brown. In a microwave safe bowl with lid, blend pepper, garlic, oil, water, salt, and chicken. Marinate the chicken for 30 minutes or more. Mix salt, cayenne pepper, and breadcrumbs on a separate plate. Coat chicken with the bread crumb mix. Place the chicken pieces on top of a cookie sheet. Prepare the spicy basil ketchup by mixing ketchup and sweet chili sauce, then blending with fresh basil. Now, preheat the oven to 200° Drizzle a baking sheet with olive oil. Mix buttermilk with chicken separately. Now, blend grated zucchini, ground almonds, cornmeal, corn flakes, cayenne pepper, Kosher salt, black pepper, and smoked paprika. Coat the chicken pieces with the crumbs. After brushing with the olive oil, put the chicken pieces on a baking sheet. Bake for 10 minutes. Stop the oven and flip the pieces. Bake again and serve warm with the spicy basil ketchup. Cover a baking sheet with cooking spray. Add beaten eggs with water and mix with chicken pieces well. Now, mix the herbs and spices well. Add some oil to it. Toss chicken pieces in the mixture and coat evenly. Now, put the chicken pieces on a baking sheet. Bake the pieces at 220 °C for some time. Then, flip the pieces over. Stop when the chicken pieces turn tender and brown. 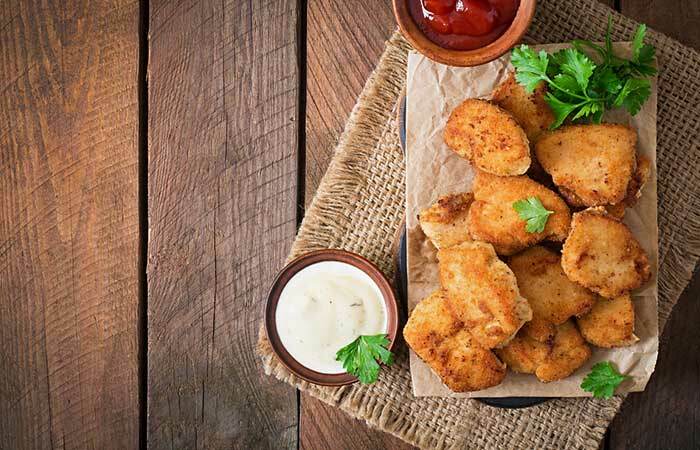 There you go – 20 yummy chicken nugget recipes that are super easy and quick to make. Try them today and win hearts! Please let us know which one you like the best by commenting in the box below. Take care.